Already the country’s third-largest cider manufacturer and the biggest own-label supplier in the country, the Aston Manor story is an exciting one, and one that continues to unfold. Aston Manor became aware that multi-packing of cans in a film only shrinkwrapped format offered an opportunity for further formats and savings on packaging and subsequent waste to their customers for cans. The can line at the Tiverton site has the possibility to add up to five different types of multi-pack shrinkwrapper formats and Enterprise Tondelli consulted in this design process to give maximum flexibility. In little over 30 years Aston Manor Cider has grown to be one of the UK’s major apple and fruit cider producers. This meteoric rise is a culmination of carefully monitoring trends in the drinks market along with the development of a range of products to meet every need. Heavy investment in State-of the-Art packaging machinery allows them to keep abreast of market trends which are looking for environmental packing solutions such as the glass-alternative PET bottles and more recently aluminium bottles. A solution that’s not only green but extremely safe, and ideal for concerts and city-centre bars. With two UK sites and four packaging lines they are able to offer a wide variety of packaging solutions to their customers. These range from hi-cone cans, to glass bottles in cartons or tray and film to small and large pack PET in film only. On the two sites Aston Manor have had experience of a number of shrink wrappers from various suppliers as well as the five Baumer packers purchased from Enterprise over a number of years. An investigation was made of the market to find the best solution with key performance indicators such as quality of finished pack, speed of film reel change, ease of format change over as well as simplicity and possibility for in-house format additions. The machine was specified to be able to run at 240 packs per minute on the following but not restricted to, formats running single, twin and triple lane as appropriate:- 4 packs, 6 packs, 8 packs, 12 packs and 20 packs. Ultimately a Baumer multi-pack shrinkwrapper was selected from Enterprise Tondelli and was installed late last year. One key feature of the multi-pack shrinkwrapper machine is the automatic reel change device. This patented systems means that the machine does not need to slow down for the reel change and no operator is necessary. Additionally there is no welding bar but two film holders with two independent film cutting sections. The two easy pull our carriages ensure good access for reel change whilst the machine is running at normal speed. An additional benefit is that due to the short film path (no dancing rollers) there is lower film consumption and higher line running efficiencies with increase of line yields. A massive advance has been made by Baumer and their new shrink tunnel. After several years of development the tunnel was launched 4 years ago to great success. With differing colour shrink films and specfications maximum flexibility is required to give the best printed film multipack. On the new Baumer tunnel not only can you adjust the air flow, air temperature and air pressure but also the position of the tunnel chamber walls thus giving greater control. When running single lane only the side air chambers are used, when running twin lane a middle chamber is activated and moved into position by handwheels. When running triple lane a further chamber moves into position to give the same air flow and characteristics for all lanes and all packs. A new type of heating element is now used located in the side walls of the tunnel. Additionally fans and air flow controls are fitted for the lower part of the tunnel to give yet further separate control of air flow/temperature for the overwrap. This results in less film build up on the tunnel chain as well as improving the lapseal. This coupled with Baumers special energy saving features give a 30% less energy consumption compared to other units. The result is a world class pack. 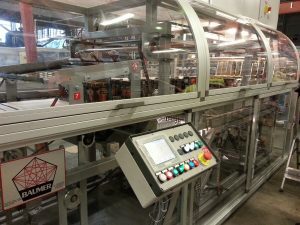 The electronic architecture of the Baumer multi-pack shrinkwrapper is robust enough to allow customers to modify parameters and also add new formats by themselves reducing engineer costs by manufacturer as well as giving great flexibility for the site. Some further clever features allow easy change over with switches when changing from single to twin to triple lane film reel handling resulting in less downtime and greater utilisation. The multi-pack shrinkwrapper uses industry standard electronic components coupled with no black box technology to make the most open machine possible. Full height clear sliding “cathedral” doors allow good visual inspection of the machine without stopping the unit and easy access to the complete machine for maintenance. Baumer Spa of Bologna have been manufacturing end of line packaging machine for many years and can now offer a multi-pack shrinkwrapper from 20-200 cycles per minute and wraparound cartonners at 80 cartons per minute and combined machines for cartons, trays, film only at 80 cycles per minute. Other recent innovations include machines for tapered yoghurt pots where the removal of a tray whilst not going completely to film only means a machine payback in less than 18 months. Established in 1977 Enterprise Tondelli are based in Parma, Italy and Bedfordshire in the UK and handle projects both in the UK and worldwide. 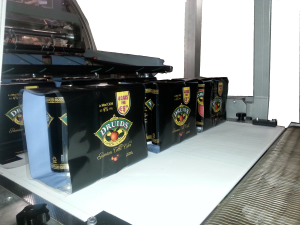 These projects include from turnkey factories to single machine integrations in the beverage and packaging fields. For further information please phone on +44 1525 718288.